Effective leadership outperforms ineffective leadership, which is why we think leadership is a primary competitive advantage and strategic priority. 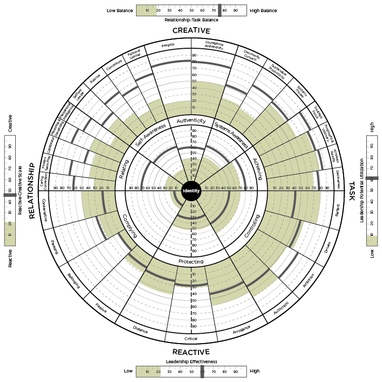 The Leadership Circle Profile™ is the only competency based 360° profile that measures two primary leadership domains – Creative leadership competencies and Reactive tendencies. It then integrates the information so that the key opportunities for development immediately rise to the surface. 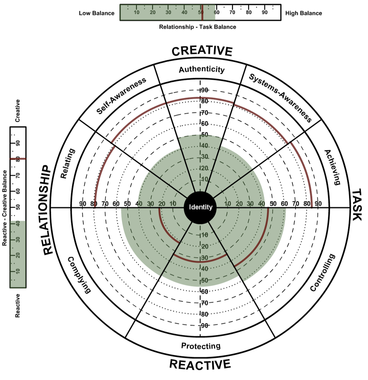 The application of self and third party assessments in the Leadership Circle Profile displays comparison of self-perceived behavioral tendencies and those reported by others in a graphic that invites reflection and creates self-awareness. Unlike most assessments that measure only competencies, the Leadership Circle Profile™ reveals to leaders and managers what they are doing, why they are doing it, and what actions they can take to lift their leadership to a higher level. In other words, it reflects a leader’s operating system – the internal assumptions or beliefs that guide behavior in both domains. Managers are able to see how their inner world translates into a effective or ineffective leadership. Using this approach increases the inner awareness that correspondingly affects outward behavior and sustainably increases leadership effectiveness and performance. The effectiveness of the leadership system in an organization determines, to a large degree, the organization’s performance, especially in volatile and uncertain business environments. Now there is an assessment that measures the health of your leadership system—the culture of leadership in your organization. The Leadership Culture Survey™ delivers a powerful “MRI” of your leadership culture. It allows you to see the whole picture and discover a compelling rationale for change. The survey can be used for an entire organization or for a specific leadership team. The Leadership Culture Survey™ reveals valuable data that tells you how your people view their current leadership culture and compares that reality to the optimal culture they desire. By finding the gap between their current culture and their desired culture, it instantly reveals key opportunities for leadership development. Leadership Culture Survey is also ideally suited to measure and illustrate how organizational culture compares to that of other organizations and thus lends itself exceptionally well to assess the organizational culture compatibility of organizations considering partnering relationships and facing mergers.